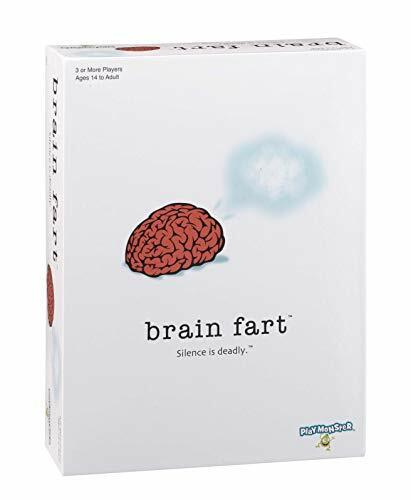 PlayMonster Brain Fart – The Party Game Where Silence is Deadly! PlayMonster 7691 - Think fast and shout your answer. Because silence is deadly! roll the big cubes to get your nine categories, buffet foods, and grab that cube! hurry before the brain farts and you lose a token! with 54 categories and 21 letters, hotter or colors, and then press the brain timer to get your letter and start the game! take turns naming things in a category that start with that letter, like contagious things, the game is different each time you play! for 3 or more players, ages 14 to adult. If the letter is m, or "my mom" for drama queens, you could answer "merlot" for the stress reliever cube, or "Magenta" for color. Get it?! With 54 categories and 21 letters, game play is always different! Roll the giant cubes, tap the brain timer to get your letter and start the countdown and go! Take turns naming things in the categories shown, that start with the letter displayed! Winning Moves 1199 - Ages 7 to adult. Includes: 2 oversized foam pig dice, 1 drawstring pig storage pouch, 1 oversized score pad, pencil, illustrated instructions and pass the pigs history. Test your luck using these fabulous over-sized foam swines that can hit all the pig poses from traditional Pass the Pigs! Players roll the comical pigs as many times as they dare on each turn to rack up points. Includes two oversized foam pig dice, one drawstring pig storage pouch, one pencil, one oversized score pad, illustrated instructions and Pass the Pigs history. But press your luck and roll a "pig out" or an "oinker" and lose them all. Don't get piggish or run the risk of rolling the pig-dastardly Oinker and having your score wiped out! Winning Moves Games Pass The Pigs: Big Pigs - Recommended for two or more players. Landing tricky poses: once you get comfortable tossing Big Pigs you will discover that throwing them in different ways helps achieve trickier poses. Don't get piggish! roll both big pigs as many times as you dare, scoring for each landed pose. Object of the game: be the first player to score 100 points and win the game!